Special Offer: 100-Year Site License for only $100! FROM 9/11 TO "THE GREAT RECESSION"
The Global Economics Game is an educational software game that simulates macroeconomic activity in a global context. Players are in charge of their nation's economic policies. They are the chief economic advisers to the president, the legislature, and the central bank of their countries. The object of the game is to promote balanced economic growth without excessive pollution, while maintaining full employment without too much inflation. Fiscal, trade, and monetary policies are used to avoid undesirable situations such as a depression or stagflation. Students, faculty and economics departments at high schools, colleges, and universities. International business programs at academic institutions. Training programs at international companies and organizations. Parents who want to give their sons and daughters an educational gift. Persons who like to play strategy games. Anyone interested in the myriad of forces that shape the global economy. "The Global Economics Game represents an excellent vehicle for providing impetus and stimulation for students to learn more about macroeconomics. Students learn about the difficulties and tradeoffs associated with stabilizing and balancing a nation's economy through the use of discretionary economic policies, all within the framework of a challenging and fun game. The game realistically simulates the interactive economic performance of nations based on (1) fiscal, international, and monetary policies supplied by the student 'policy makers' and (2) a set of predetermined socioeconomic competitive conditions and shocks that are changing throughout the game." We are very excited about the latest edition of The Global Economics Game. In addition to the original game which includes the regular version and a simulation of the economic history of the United States from 1900 to 1999, this latest version includes a simulation of the first decade of the 21st century plus the years 2010-2011. It portrays macroeconomic principles and policies in their historical context. You can play one or more decades at a time. The player with the highest score at the end of the selected time period wins the game! The United States economy performs just as it actually did historically. The other economies selected will behave similarly, but players are able to use polices to improve the performance of their economies. The original 20th Century Economic History Game is still an alternative. It simulates American economic history from 1900 to 1999. At the beginning of the 20th century there will be very little inflation, because countries were on the gold standard. But World War I will bring galloping inflation. Following a turbulent post war recession, the Roaring 20s will be prosperous until the great stock market crash of 1929. During the 1930s everyone will be trying to get out of the Great Depression. The economic effects of World War II will dominate the 1940s. The 1950s and 1960s run more smoothly. In the 1970s and early 1980s stagflation caused by two oil shocks will be the challenge. The United States is very difficult to beat in the 1990s, because it was a prosperous decade of balanced growth and disinflation. The game also includes a simulation of the first four years of the 21st century including the global recession that began in 2001. Although the focus of the game is the historical economic performance of the United States, the game includes Decade Events that pertain to other countries as well. Many of the world's most significant events of the 20th and 21st centuries are included in the game. Other events are more a matter of interest than significance. The events depicted below are a small sample of more than 200 events that occur in the 20th century history version of the game. 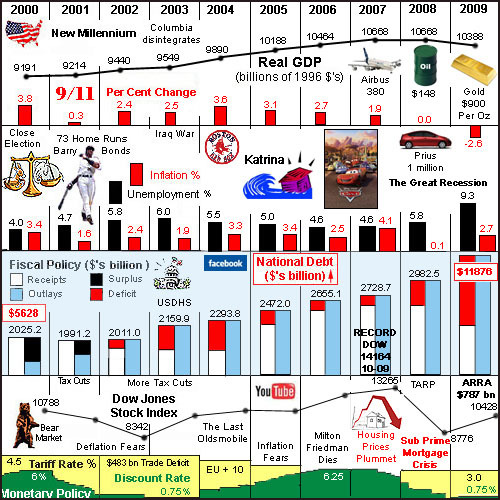 Decade Charts: For each decade there is an attractive and informative chart depicting United States data for real GDP, unemployment, inflation, the federal budget, the stock market and interest rates, as well as interesting and significant events. The Decade Charts below are for the 1920s and 1990's. OTHER NOTEWORTHY FEATURES . . .
. . . COMPUTER MANAGED COUNTRIES: These countries are advised and managed by Professor N.D. Cator, and he is a good Keynesian economist. In the 20th century version of the game his one year economic forecasts are accurate and he sets monetary policy accordingly. This gives him an advantage and makes him difficult to beat.
. . . LAISSEZ FAIRE COUNTRIES: These countries are programmed to move toward the center of the playing area most of the time. They represent the neo-classical theory that market economies automatically adjust to an economic imbalance. They are very competitive opponents and are quite capable of winning the game! This feature gives you the option to simulate the great theoretical debate between neo-classical and Keynesian economics. It adds a whole new dimension to the game and makes it that much more thought provoking, educational, and fun to play.
. . . RATINGS: At the end of the game, each player receives a rating for how well they played the game. The highest rating is assigned the title of "Chief Economist." The rest of the ratings descend as follows: Senior Economist, Associate Economist, Assistant Economist, Intern Economist, and Student Economist. The lowest rating is "Novice Economist." Place an Order: The price of 1 CD is $20.00 plus $5.00 for processing, packaging, and mailing. Volume discounts and annual site licenses for large institutions are also available. THE GAME IS ALSO AVAILABLE IN DOWNLOAD VERSION WITH NO S&H FEE. You can place a direct credit card order through PAYPAL or a credit card or make a printed copy of our order form and mail it to the address at the bottom of the form. Click here to place an order: order form. Questions and Inquiries: If you have any questions regarding the game or its applications, please feel free to contact us at: Send E-mail to: econgame. "I love the idea of adding the 20th century economic history component to the game. I think it adds greatly to its educational and entertainment value. The decade charts are colorful and interesting. I am adopting the game for use in my Principles of Economics class next semester." "The 20th century economic history game is fun and entertaining. It allows players to realize the difficulty that governments have faced in implementing policy to reduce business cycles." "The 20th century economic history is a great addition to a great game! The opportunity to play each country against another in a multi-player format is one of the better features of the game." "The 20th century economics game is a good way to look at how the economics have advanced over time and how the AD-AS structure has changed alongside. The game is easy to follow and very informative." "The 20th century economics history is an excellent addition to the game. It would be nice to have a version that focuses on Canadian economic history." "The Global Economics Game and its 20th century economic history feature would be useful as a supplemental course activity to reinforce economic concepts. It's not too difficult for students to understand." "My special honors section of Economics 1B (Principles of Macroeconomics) played your World Game of Economics in our graduate student computer lab. It was a practice round for our class contest, and they enjoyed it very much. One group decided to play as a team against two computer opponents, and won! A second group just played against each other. The third group played against each other plus a computer opponent. We didn't make use of the laissez faire option at this time. The students came away thinking about the game and their strategies and began to have a glimmering of its relationship to the underlying economics. They eagerly borrowed all of the CDs to study the game for their homework and for the final round of the class contest. The winners get treated to a dinner at the end of the semester. So it's working well. Thanks for creating the game." "The World Game of Economics presents nearly all of the material that we teach in a basic macroeconomics course in a most unique, innovative, and effective way." "Many thanks for the new lesson plans that go with The World Game of Economics. Students seem to learn more with a structured approach to the game. The students in my large intro class use your game as part of their country journal exercise. The game has given them a greater sense of consistent policy-making. I really appreciate all of the great service on the game, especially the World Economics News articles." "I teach senior economics students in Ontario, Canada. I used The World Game of Economics with a small class of eleven students. They have all enjoyed being able to make a variety of macroeconomic policy decisions in an attempt to influence the GDP growth of their countries. As an educator, it is nice to have a simple simulation that enables students to test their understanding of abstract economic ideas. My own sense is that the game is a useful tool for helping students differentiate between fiscal, monetary, and supply-side approaches to the economy. The current events that occur during each player's turn are excellent. I like the product." "I was the fortunate winner of your scholarship contest last year. When I received the award I did not know what I would be doing with the money. However, I just received my acceptance letter from Stanford University on early admission for next fall. I thought you would like to know this, because that is where the money I received for your contest will be going. I have been sending scholarship applications all over the place. Yours was the first one I received, and I sincerely want to thank you for making it available to me. It was pretty encouraging to receive it, and it was part of the reason that I sent my application into Stanford. Thanks again." "Economics is a hands-on science. One cannot simply sit down, open a book and suddenly master economic theories. Interaction with such a complex subject is imperative. By playing The World Game of Economics, my knowledge of economics was brought to a higher level in that I am dealing with economic issues that countries actually face and I am seeing the effects of certain economic decisions. But an important aspect of the game is that it is fun! As I played, I did not think, 'I have to learn economics now.' I was simply learning it. Many students would benefit greatly from this program. Economic terms are explained clearly, as are the consequences of each decision made. The game is creative, enjoyable, and a brilliant new method of teaching economics." "I was pleased to play The World Game of Economics in a classroom setting. I was really impressed with it. It's easy to learn to play and is extremely visual with lots of pictures which makes it enjoyable. I got a great understanding of what happens to the economy under certain situations. I learned a lot from this game. I should rather say that this game cleared up a lot of confusion that I had about the economy. I would definitely recommend the game to anybody." "At the lab I find the game to be fun, exciting, and addictive. I keep trying to beat the computer. I haven't been able to beat it yet, but I will keep trying until I win. It's a great game. Thanks for inventing it." "I tried several times to beat the computer, but I lost anyway. When a classmate and I began playing the game against each other, it became easier and more fun. I liked this way, because the two of us were almost always even. For example, at one point the scores were 70 to 68. We both felt good about our knowledge in macroeconomics. I also liked it, because we both went into the red zone but were able to use our economic policies to get out of it. I have had a very worthwhile experience playing The World Game of Economics." "The game's best quality, in my opinion, is its careful and thorough explanation of all the macro economics related terms and concepts. No one really loses in the game, because everyone gains a better understanding of the terms and concepts presented. Being able to see how each current event pushed your country either closer to or farther from the ideal location was also a plus and helped to illustrate the major effects of changes in aggregate demand and aggregate supply. Overall, my group and I enjoyed The World Game of Economics and took away from it an experience that granted a sense of economic enlightenment on the subject matter." 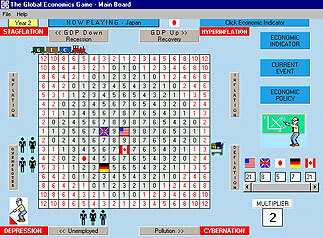 The World Game of Economics was a very interesting way of applying the economics that I had already learned in class. The game is versatile, playable for enjoyment alone, yet engrains the economics that it demonstrates into the mind of the player. I thought that the policy gridlock was a good touch, as the government is often plagued by such policy barriers. I found that the game was a unique way of making economics fun and a good way of committing the effects of various economic policies to memory. I also liked the availability of selecting from many different countries. To close, I think that your game is a very good program that demonstrates the effects of various influences on the economies in this world." education resources in economics on the worldwide web. Ltsn as a macroeconomics teaching resource. for both K-12 and college educators.
. . . "A very useful collection of high quality lessons come with the software."
. . . "The educational benefit is worth the time it takes to learn how to run/operate the game."
. . . "It can be used to address a variety of objectives, including macro principles and historical conditions."
. . . "It extends and enhances what a teacher can do."
. . . "The Program operates using many real-life factors and conditions -- it is connected with reality." Questions and Inquiries: If you have any questions about the game or its applications, please feel free to contact us at: Send E-mail to: econgame.